University of the Pacific (specifically, the Gladys L. Benerd School of Education) is one of 35 California universities selected as a host site for the fourth annual Better Together California Teachers Summit 2017. To meet each student’s needs, teachers know how important it is to personalize learning. These tailored strategies give students a voice and choice in their learning, increase engagement and generate better outcomes. However, what do these tailored strategies look like in the classroom? To personalize learning effectively, teachers need to experience it for themselves. This FREE event brings together thousands of teachers from across California for a day of learning featuring a TED-style EdTalk presented by a teacher along with Edcamp discussions led by teachers, for teachers. Edcamps are organic, participant-driven professional learning experiences for educators across the country and worldwide. The vision is to create a network of educators dedicated to participant-driven, professional development that enhances student learning. Check-in and breakfast start at 7:00 a.m with light snacks throughout the morning. The afternoon portion of the day will be sponsored by the School of Education and ends at 1:30 p.m.
An internationally recognized authority in creativity and innovation in education and business, In his keynote remarks, Sir Ken will challenge the way we’re educating our children and champion a radical rethink of our school systems. Samantha McCoy, alumna of Pacific's Gladys L. Benerd School of Education, Lodi USD middle school science teacher; instructor with Teachers College of San Joaquin. Varaxy Yi Borromeo, alumna of Pacific's College of the Pacific and Eberhardt School of Business. This fall Borromeo begins a tenure-track faculty position at CSU Fresno School of Education and Human Development Department. Learn more about EdTalk speakers here. Jasmine Ali, family trauma intervention coordinator for refugee resettlement in Sacramento, domestic violence, sexual assault and human trafficking therapy intern with Empower Yolo and UC Berkeley alumna. Please use the "Register" button to the right to reserve your seat today! This event is co-sponsored by the Association of Independent California Colleges and Universities, The California State University and the New Teacher, Santa Cruz, CA. 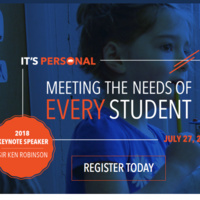 The Summit is free and open to all California pre-K-12 teachers, teacher candidates, school administrators and other educators, such as instructional assistants, school psychologists and school librarians.